The holiday season allows you to be extra in every way and in every aspect of your life. You shop a lot. You spend a lot. You party a lot. You wear ugly sweaters. There are some seriously extra holiday brow trends happening RN and they have carried over from 2017. 'Tis the season to go all out with your makeup, too. Because why not?! Holiday brows are cute, quirky, elaborate, awesome, celebrational, merry, bright, and festive. The social media space is teeming with artistic brows designs that you will enjoy looking at and will want to replicate if you have the time, patience, and creativity that they require. This is not a quick 'n' easy beauty trend. Some of the holiday brow trends are super intricate, elaborate, and highly designed. Others appear more simple and streamlined. Whatever your preference, you can do a festive brow this season. There are plenty of products at Ulta and Sephora that can assist you with the task, like Kat Von D's colorful Brow Pomades. 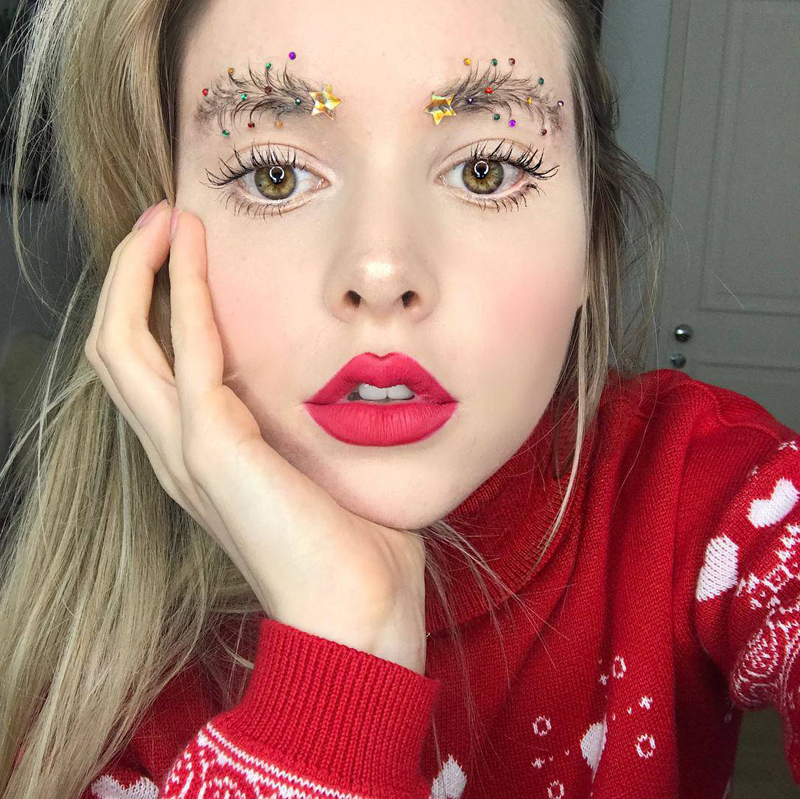 There are Christmas tree brows all over Instagram since you can brush brow hairs into tree branch shapes and then adorn them with glitter and other ornaments. There are Santa-inspired brows, too. 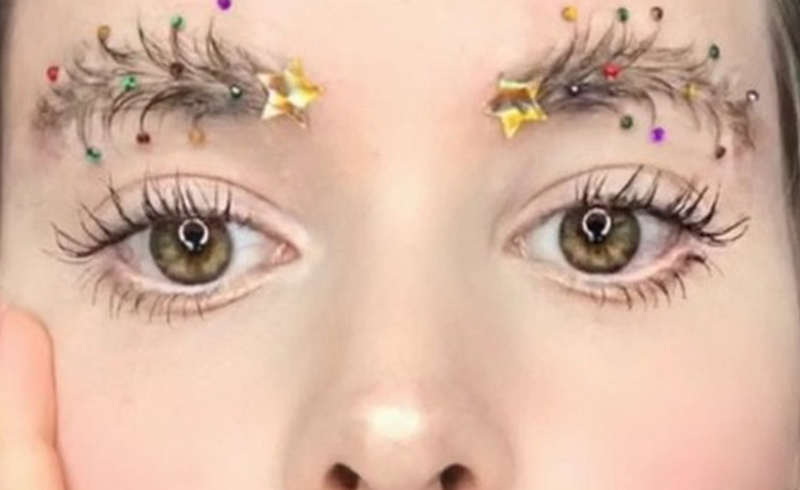 Check out the most awesome holiday brows on Instagram below. Makeup enthusiast Rachie Candice, who uses the @rachiecandice handle, created these awesome Christmas tree brows. Who needs presents under the tree when you gawk at these brows? The hearts, stars, and dots were an amazing touch. The rest of her eye makeup was minimal, with a defined upper lashline. That was the perfect contrast to these amazing freakin' brows. Rachie Candice told Bustle via Instagram that a friend sent her a photo of Christmas brows by @taytay_xx and dared her to recreate it. She accepted the challenge and says, "After an hour with hairspray and various glues proved I did not possess the natural hairs needed to sculpt the tree shape, I faked it with glitter." She faked it so, so good. Great job, Rachie. Tonya, who goes by the @tb_beauty13 handle, crushed Christmas brows. The shape, the decorations, and the fact that she paired 'em with a feline flick and sparkly, green-tinted shadow certainly upped the holiday brow game. Her version is party-ready yet really wearable, too. That aesthetic combo is not easy to do — but she did it. She also noted that this look was tough to pull off but she "sleighed" it. The Bordeaux-like matte lips were the perfect finish to this present-ation. If you are really ready to do this trend and want to follow along with a tutorial, this seven-minute instructional from last year spilled all the tea about Christmas tree brows. Sparkle and shine. These brows showed up late last year on @hunnybunnytwee's Insta handle. But they've popped back up again since they are still relevant this season. These brows are so sparkly and provide such inspo. This creative artisan paired her red ornament-decorated brows with majorly curled lashes and a sparkly and silvery bottom lash liner. It was so utterly adorbs and festive. Wow. Just wow re: these brows. This Instagrammer, who goes by the @bomber1313 handle, went all out with the glitter and the classic Christmas tree shape. These Balsam brows are just beautiful. She noted that it wasn't easy to take the glitter off. While it may have been a chore to remove, the end result had to be worth all of the before and after effort. Check out her YouTube channel here. Santa brows are such a thing. Cassandra, who goes by the @xo.c.guerrero.xo handle, rocked thick, well-shaped and 'scaped, and bold brows. The red and white Santa hat perched on the arch is just about the cutest and most Christmas-sy touch. She added sparkle red and matte green shadow, upping the seasonal quotient of this look. It's utterly adorbs and looks sorta easy to do.